The article sets forth the results of switching an AC arc furnace with a capacity of 20 t (DSV-20) over to DC supply by the method developed by OOO NTF EKTA. After reconstruction, a model DPPTU-20 DC arc furnace of the new generation was commissioned, a description of the furnace is given. Technical-and-economic data of the furnaces before and after said switch-over are compared, a considerable improvement is noted. 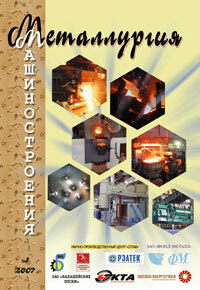 Quality of steel produced has notably improved. An experiment was conducted to make open-hearth acid steel 38X2H2MA by active process (instead of silicon reduction process). It was found that the active process comprising casting liquid steel under vacuum in combination with inoculating it with a silicocalcium addition results in a better removal of nonmetallic inclusions, which, in its turn, enhances ductility and tenacity in the direction transversal to the forging's axis. A comparative analysis of the processes of homogeneous and heterogeneous nucleation at crystallization of metals on substrates with different surface curvature and interface surface tension is given. It is shown that basic mechanisms of the processes of nucleation at solidification of metals are homogeneous and heterogeneous on proper undissolved nanocrystals, which can stay in highly dispersed and (or) colloidal state in the melt for quite a long time. A review of the monograph "Structure-and-Energy Models of Reliability of Materials and Machine Parts"
A review of the monograph by S.I. Gubenko, V.V. Parusov, I.V. Derevyanchenko "Nonmetallic Inclusions in Steel"